but some women aren’t aware that symptoms related to our changing hormones can start in our mid-30s. This time of life is sometimes referred to as premenopause, and the time closer to the end of our menstrual cycles is referred to as perimenopause. But more important than what we call it is what we do about it. Dr. Whitney Pollock, an OB/GYN with the Gynecology Center in Pottsville, Pennsylvania, believes we women do not need to suffer silently with symptoms that too often disrupt our lives. In this videotaped interview with Dr. Pollock, she urges women to educate themselves about their symptoms and to talk to their health care providers. Dr. Pollock says that heavy menstrual bleeding is the No. 1 reason that women visit their gynecologists. Heavy bleeding can cause anemia and affects quality of life, causing women to miss out on activities. This is not necessary or acceptable, she says, because there are many treatment options available. Hysterectomy is not the only (or best) solution for most women. For those of us who are through having children, a new minimally invasive procedure that takes five minutes and has no recovery time may put an end to heavy bleeding. What types of medications ease perimenopausal symptoms? There are a variety of medications that may ease perimenopausal symptoms in women. These include birth control pills, hormonal products, vaginal estrogen, antidepressants, testosterone, and gabapentin (Neurontin). There is no “cure” for perimenopause. One of the most effective and infrequently mentioned methods of treating the spectrum of problems encountered during the perimenopause is the combination birth control pill. These pills contain synthetic forms of estrogen and progesterone, the two primary hormones produced by a normally functioning ovary. They act by preventing the ovary from releasing its own estrogen and progesterone. They also work to inhibit ovulation, thus preventing pregnancy. While on birth control pills, a woman’s body responds directly to the hormones in the pill, and her endogenous ovarian hormone production is suppressed. Thus, the irregular, frequently heavy, menstrual periods, which are common during perimenopause, can be eliminated. She will bleed in response to the hormones in the pills. The birth control pills also prevent ovarian cyst formation, which is common during perimenopause, and is directly tied to irregular ovulation due to erratic ovarian hormone production. Birth control pills are also known to decrease breast cyst formation, and they may also decrease the frequency and intensity of headaches. Who should not use oral contraceptives for perimenopausal symptoms? During perimenopause, the second stage of the menopause, it is common for many women to experience a myriad of different symptoms, including hot flashes, night sweats, fatigue, and loss of libido. Fortunately, there are many treatment options available for managing symptoms. Ranging from low to high risk, perimenopause treatments fall into one of the three categories: lifestyle changes, alternative medicine, and medication. Learn more about the different perimenopause treatment options available. When treating their symptoms, women are encouraged to start with lifestyle adjustments due to their low risk of side effects. While lifestyle adjustments can positively impact overall health on their own, they can more effectively treat menopause symptoms in conjunction with alternative medicines. Together, these methods can typically decrease the severity and duration of most menopause symptoms. When these treatment options are not enough to manage symptoms, however, some women turn to clinical measures, including medications or surgery. Due to the potential side effects of these options, women should consult a trusted medical professional before beginning such treatments. Learn more about the benefits and risks of all these treatment options. All of these lifestyle changes can make a big difference in the severity and duration of menopause symptoms. While these changes may seem insignificant, they can go a long way toward improving your health and overall well-being. Eating a nutritious, well-balanced diet is vital for overall health, as well as for managing many different menopause symptoms, such as hot flashes and night sweats. Eat a diet with plenty of fruits and vegetables, as well as whole grains, calcium, and lean proteins. Some foods, such as soy, can even help balance estrogen levels. Dietary choices are just one of the many ways you can manage the severity of your menopause symptoms. Exercising during perimenopause helps regulate mood, promotes cardiovascular health, and builds muscle and endurance. 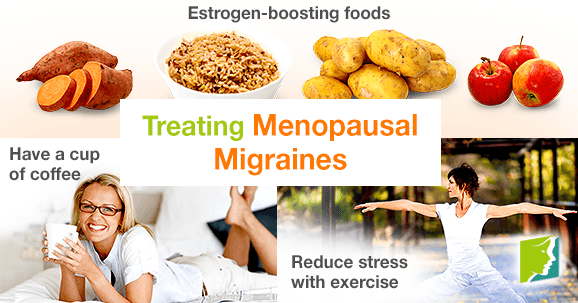 It can also help decrease the frequency and severity of many menopause symptoms. Exercising 30 minutes a day, five days a week is recommended for overall wellness. Some recommended exercises include swimming, brisk walking, jogging, or yoga. Phytoestrogenic herbs, which contain plant compounds similar to human estrogen, can replace depleted estrogen and mimic the effects of human-produced estrogen in the body. Some phytoestrogenic herbs include black cohosh, red clover, dong quai, and soy. While phytoestrogenic herbs are a great option in the short term, the body will eventually reduce its own natural estrogen production if these natural hormones are constantly supplemented with external estrogen, causing treatments with phytoestrogenic herbs to lose their potency. Unlike phytoestrogenic herbs, hormone-regulating herbs stimulate the endocrine system, which balances hormonal production. Because hormone-regulating herbs help the body naturally produce estrogen, they can be taken in the long term with very few potential side effects. A combination of approaches is usually the most effective route to take. Lifestyle changes combined with alternative medicine will most likely be the best way to alleviate the symptoms of this hormonal imbalance. While this approach is optimal for many women, others will find that they want or need to go to the third level of treatment. When lifestyle changes and alternative medicine are not enough to negate symptoms, clinical measures may be necessary to manage menopause symptoms. The most common drugs used during perimenopause are artificial or synthetic hormones, generally known as hormone replacement therapy (HRT). While HRT can be highly effective in treating menopause symptoms, it can increase the risk for several types of cancer, blood clots, stroke, and heart disease. Due to the potential side effects, women who are interested in using medication or having surgery during perimenopause should first consult a trusted medical professional before beginning treatment. These three levels of approaches are not mutually exclusive. A woman may use different treatments at different times or any combination of them, depending on the duration and severity of her symptoms. Today, more and more women find that dealing with perimenopause symptoms is best accomplished via a combination of healthy lifestyle and alternative treatments. Hormone-regulating herbs for treating hormonal imbalance, as seen in the second approach, are considered the most effective treatment for perimenopause symptoms. Low cost and the absence of side effects are only some of the reasons why this treatment option is preferred. Macafem, for example, is an excellent hormone-regulating herb. It’s simple: rather than putting in hormones from the outside into your body, Macafem stimulates your hormone glands, helping them produce the necessary hormones naturally. This is what makes Macafem so unique. Click on the following link if you want to learn more about Macafem. As women enter middle age, many of them will experience the second stage of the menopause process: perimenopause. In this time, the female body transitions into its non-reproductive years, with noticeable symptoms occurring. For many women who are either experiencing this stage or will soon experience it, it is important for them to better understand what perimenopause entails, including: knowing whatperimenopause is, at what age perimenopause occurs, and the different tests available to diagnose perimenopause. While many women understand the basics of menopause, fewer women recognize the signs of “perimenopause”. Perimenopause is the second menopause stage, which occurs after pre-menopause. While many women are fully fertile during pre-menopause, perimenopause signals the gradual decline of women’s reproductive functions. As a perimenopausal woman’s body is preparing to permanently shut down the ovaries, this causes a natural decrease in estrogen and progesterone levels. These decreases in hormone levels are the primary cause of most perimenopause symptoms. There is not a set age for perimenopause to begin. However, most women report the first symptoms in their early 40s, with some women beginning perimenopause earlier or later in their lives. In fact, some women begin perimenopause as young as their early 30s. This, however, can be indicative of early onset menopause or other potential health issues, so it is important to consult a medical professional if you are experiencing perimenopause symptoms at this age. The timeline for experiencing perimenopause symptoms can vary greatly. For some women, perimenopause can occur for one to three years preceding menopause. For most women, however, perimenopause can last for ten years or longer. Ovarian shutdown does not happen overnight, and the body needs time to adjust to the hormonal deficit created by decrease of progesterone and estrogen production. Since there is not a definite time for the onset of perimenopause, women need to be in-tune with their bodies. Paying attention to any changes and abnormalities in their bodily functions can help them discern whether or not they are experiencing perimenopause symptoms. If they suspect they are going through perimenopause, there are certain tests available that will help them know for sure. Perimenopause tests can also be useful for detecting the presence of other, perhaps more serious conditions. Since perimenopause tests are quick and easy to administer, they are the most effective way to determine if you are experiencing perimenopause. Although perimenopause can be a difficult transition to experience, knowing more about its causes and the available treatment options can help with symptom management. Click on the following link to learn more about the causes of perimenopause. All women know that menopause is a natural, inevitable stage of life. As with any other major change in their reproductive functions, women also know that hormones are at the very root of the changes they experience, especially during the most symptomatic stage of the menopause process: perimenopause. Besides the hormonal causes, however, experts have identified other external factors that can influence the onset of perimenopause. In the following sections, women can find detailed information regarding the hormonal causes – as well as the external causes – of the second stage in the menopause process. The female body is very complex. It relies on a very delicate balance of hormones to perform basic bodily functions, including regulating body temperature, releasing eggs, and managing other vital aspects of health. When perimenopause starts, the body experiences a natural decline in hormone production. Vital hormones in the female body – such as estrogen, progesterone, and testosterone – fluctuate and gradually decline, leading to the occurrence of many perimenopause symptoms. For up to 10 years, women may experience the effects of hormonal imbalance. As a result of the low levels of hormones in the body, the ovaries no longer release mature eggs. This sends women into the post-reproductive stage of life, generally beginning in their 40s – 50s. However, until menstruation has ceased for one year, pregnancy is still a possibility. According to many studies, women who smoke go through perimenopause earlier than women who don’t. This is in part because the chemicals in cigarettes lower estrogen levels. Studies have shown that periods of prolonged stress – such as stress triggered by financial or emotional strain – can cause the body to enter perimenopause earlier than it normally would. Radiation or chemotherapy. While both of these treatments can damage the ovaries and accelerate the occurrence of symptoms, radiation and chemotherapy do not automatically trigger perimenopause. Depending on overall health and genetics, some women will either experience symptoms, or it is possible that the ovaries will not be greatly impacted and continue to function in a normal range. When a woman needs to have both of her ovaries removed (a bilateral oophorectomy), she may abruptly begin to experience perimenopause symptoms. Genetic and autoimmune diseases.Conditions such as Turner’s syndrome or thyroid disease can trigger the onset of perimenopause. Whether perimenopause is due to hormonal or external causes, the symptoms women experience in this stage are quite similar, sometimes only varying in severity and frequency. For a comprehensive list of common symptoms, please click the following link about perimenopause symptoms. Perimenopause, the second stage of the menopause process, may actually be one of the most recognizable stages of menopause. Many women approaching middle age experience a myriad of different perimenopause symptoms, such as hot flashes, night sweats, and mood swings. Whether mild or severe, perimenopause symptoms most often occur due to hormonal fluctuations. However, other triggers can include pre-existing medical conditions, surgery, or illness. What Are the Symptoms of Perimenopause? Even though most people associate symptoms such as hot flashes, night sweats, and loss of libido with menopause, the occurrence of these symptoms typically begins during perimenopause. This is because the body is decreasing its production of hormones and preparing to enter into a non-reproductive stage. These hormone fluctuations, however, typically trigger many different symptoms. All four are characterized by different changes and symptoms. However, symptoms of perimenopause and menopause in particular are often confused. The main difference between the symptoms of both stages is that menopause marks the point at which menstruation has completely stopped for a year. Symptoms are very similar, varying only in severity and frequency. Perimenopause symptoms can be of both a cognitive and physical nature. Unfortunately, there are many different perimenopause symptoms, and most women will experience one or more during this transition. As perimenopause sets in, it’s important to have a strong understanding of what is considered normal and abnormal. While there are plenty of common perimenopause symptoms, there are also some uncommon ones to look out for. Perimenopausal women should focus on listening to their bodies and noting any symptoms that seem out of the ordinary or potentially harmful. Common symptoms of perimenopause include many symptoms women typically associate with menopause. The most common perimenopause symptoms are listed below. While most women will only experience some of these common perimenopause symptoms, others will face more uncommon symptoms, such as the ones listed at the right. Even though perimenopause symptoms can be unpleasant and at times painful, there are plenty of treatment options available for managing these symptoms. To learn more about symptom management, click on treatments for perimenopause.